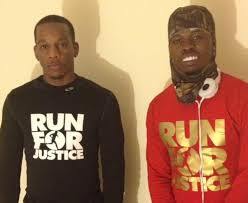 Londrelle Hall and Ray Mills set off on a grueling 550 mile run from Atlanta, Georgia, to Mike Brown’s memorial in Ferguson, Missouri, on November 3. After averaging 35 miles a day for nearly three weeks, the two finally reached their destination on a rainy Saturday afternoon, surrounded by a crowd of admirers. Hall met Mills, a 29-year-old originally from Atlanta, several years ago. They were reconnected earlier this year through a non-profit organization called Flawed Foundation, which partnered with Run for Justice upon its inception. Mills described the scene at Brown’s memorial as “surreal.” “You watch it on TV from home, and we collaborated on this idea. While we’re doing it, there’s no way to expect how you would feel until you’re actually here. When I arrived, it was breathtaking. 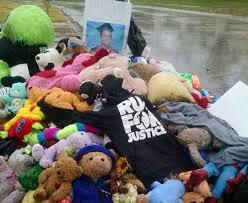 This young man was killed here coming from a store. He’s one of the main reasons we are here,” he said. When Hall and Mills set out on their journey several weeks ago, they had multiple goals. In addition to running hundreds of miles in Brown’s memory, the duo also aimed to raise $1 million on GoFundMe.com, a crowdfunding website. They intend to donate every cent raised to Michael Brown’s family in Ferguson; the relatives of 22-year old John Crawford, who was killed in Ohio; and those of 29-year-old Charles Smith, who was shot and killed by police while handcuffed in Savannah, Georgia. Money will also go towards paying the bail and court fees of protesters who were arrested in Ferguson last August. Hall and MIlls created a website and filmed a promotional video, calling for donations. They also sell merchandise on the website, with all proceeds going to the four entities. None of the money raised thus far has funded Hall and Mill’s 20-day journey. In fact, the two paid for hotels on their own dime. Ultimately, Brown and Mills would like to see their project evolve into a community-based education program, offering afterschool and summer workshops with African American History, Arts, Critical Thinking, and Youth Empowerment courses aimed at youth minorities.